The image of a delicate butterfly roaming around a wonderful field of poppies could be the one that matches the whole view of the Bulgari Papillon Voyageur, an automatic watch which is supposed to bring a touch of total class to the ones wearing it. The whole idea behind it is to give sophistication with the help of a system which seems to be rather unique in its own way. Displaying minutes is now a real art for the Bulgari Papillon Voyageur and it is a great patented method which will first puzzle every average user. Like any butterfly, this watch is designed to travel between significant important time zones for the user, giving him the great satisfaction of keeping track of both parts with great ease. It could be perceived as the ideal way to travel in a modern way by keeping track of every minute in order not to lose an important business meeting. Daniel Roth Papillon Voyageur automatic watch, with second timezone, in a 18kt pink gold case. It features an anthracite dial and a brown alligator strap with an 18kt pink gold folding buckle. Manufacture movement with unique patented Papillon display. LIMITED EDITION. The whole strong point of Bulgari Papillon Voyageur is the new display which excels in elegance and craftsmanship. It may seem complicated at first, but even a child will take only a couple of seconds to figure it out the way it works. It is not difficult at all as it presents pretty logical scenario. The first thing to see is the local hours. They are displayed in a digital manner represented by a window situated at 12 o’clock position. It will jump from one hour to the next with ease. For the second time zone, the indicator is the blue pointer situated in the center of the watch. It has the shape of a tear drop. This hand points to a sub-dial of twenty-four house which presents only the even numbers. The crown is used to set the local time. For the second time zone, the selection is made with the help of pushing the buttons situated at 10 and 2 o’clock and marked with a plus and a minus. Are you creative enough for the Papillon Voyageur?! For the people who love creativity, Bulgari Papillon Voyageur will give them exactly what they want and deserve. The minutes are easy to read as a pair of hands will indicate them by spinning on a firm central based axis. They will be revolving around a point marked as the center and in this way they resemble the movement of two planets. These planets rotate around the supposed sun and they will always indicate the right thing. The numbers of the minutes are placed on two concentric semicircles which have the beautiful pink-golden color. The two displays indicate minutes on a different scale. The inner one is concerned with marking each minute at a time, while the larger one goes from tens to tens. 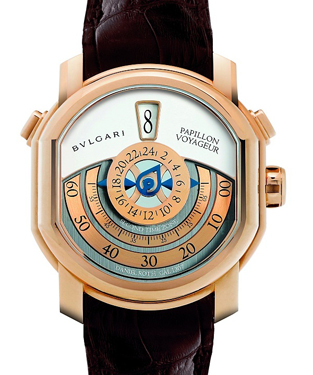 The true engineering mastery in Bulgari Papillon Voyageur is represented by the small rotating hands which will take turns when it comes to indicating minutes. They take turns at the end and the beginning of the hour by hiding and reappearing while making quarter turns. As for the looks of his amazing watch the lovers of it say that it is original and innovative. The producers have given a significant appreciation for the aesthetic part. It turns out that they have accomplished the true balance between complexity and harmony. The whole idea is to gravitate around a central point and then take everything radiating from it. The whole mechanism is full of sophistication and it is hosted in a case holding the signature of Daniel Roth. The double ellipse used as a case is made out of 18k pink gold. The dimensions of it are quite impressive, namely 46 x 43 x 15.2 mm. It is projected to hold on even in water to a depth of about 30 meters. Besides these things, the case has a crystal sapphire in a shape of a dome. The strap is made from alligator skin and the clasp made also of pink gold will give the final touch. The complex mechanism of self-winding allows the watch an autonomy of forty hours. The dial face has a white top half and a golden black satin lower one. The nicest thing is that there were only 99 pieces of this Bulgari Papillon Voyageur made which gives it the exclusivity of a limited edition. As for the price, it will climb to $52,100, quite reasonable for such a brilliant innovation. With a set of 26 jewels, this watch is ideal for any willing to pay collector. It is actually important to have it in a wide collection as this watch seems to be rare and will certainly be worth a lot more as times goes by. Movement: Fully mechanical with a self-winding feature that gives a power reserve of 40 hours.